A Blue Book pulp magazine illustration created by Leland R. Gustavson in 1938. 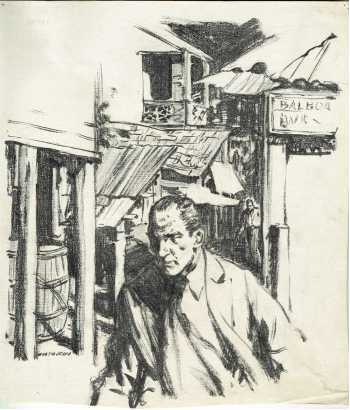 Gustavson (1899-1966) contributed illustrations to Blue Book from 1926 to 1946 appearing in nearly every issue for most of that time. 13x11" image area. Ink on canvas. We cannot find a story titled "Inside Story" during the years 1938-1940 and we assume the story was re-titled for publication.